The London Book Fair - Part 3 of 5 - What do People do All Day? Who Attends and Why? It's starts today. The London Book Fair. Over the weekend I posted my thoughts on why unpublished authors should attend this trade event. I believe it is one way of seeing the industry in action as a whole, and not just the sole operative with whom authors may be most familiar, that of the literary agent. Here's a summary of a few of the other Industry participants, and a beginner's view of some of their activities at the London Book Fair. There are two big seasons in publishing, and the Fairs tie into them, London in spring and Frankfurt in the autumn. Publishers are selling books in spring just in time for summer, and in autumn in time for Christmas, and although they’re probably not yet published, it can be a good publicity boost. Authors need to remember this long lead time when submitting books particularly for seasons or certain events. 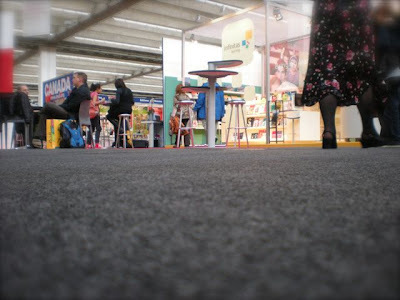 Publishers will have meetings to discuss, sell and market their ‘lists’, the books which they represent, as well as review current and past year’s business. The books that are generally on display are the books that they’ve acquired; and may be looking to sell rights in. They may have already published them but most commonly they’re books that are coming out that year or the following year. They may even be displayed in mock-up covers. The October 2008 Booker Prize winning ‘The White Tiger’, a novel by Indian author Aravind Adiga, was reportedly sold on pre-emptive offer to Einaudi in Italy, with a further five foreign deals done at the 2007 London Book Fair. Publishers may also meet with book buyers. It may seem a rather shocking revelation, but book buyers generally don’t go to the London or Frankfurt book fairs to buy books. Certainly that has never been the main topic on Sharon Kastner’s agenda in the last eight years when she has attended both the London and Frankfurt book fairs, representing major book companies, such as Libri GmbH in her role as Product Manager, International Books. Concrete bookings, author tour and marketing plans are often made at these meetings, particularly as it’s one of the few chances in the year to get the sales manager and the marketing manager from a publisher together at one table. The Fairs have also always been used to spread general – but important – information between business partners. If Libri should be venturing in to the world of audio downloads, for example, then a Fair meeting is an opportunity for discussion and sharing factsheets. A representative from this department at the publishers might actually be on the stand, which offers the opportunity to swap contact names and discuss the project in more depth. And if time allows it, they just might look at some books before rushing off to the next appointment. A further important part of the supply chain for publishers are wholesalers and distributors, who enable the storage, packaging and shipping of orders. Who serves whom, depends on many factors, but an important one is size, both in terms of the financial order and its physical storage and shipping. Large retailers who expect large orders and discounts, will often order directly from the publisher, but booksellers and libraries would rarely buy from publishers or authors directly, because the quantity of their order is not something the publisher wants to have their own staff perform, instead they outsource that role. Wholesalers generally fulfill large orders, but the financial aspects of the order have been negotiated directly between the buyer and publisher. Wholesalers provide a narrower range of services than distributors, and the two often work together, the distributor stocking books and providing to the wholesaler. Distributors standard services would include storage and warehousing of stock, order fulfillment from receiving the order to packaging and shipping, credit management and reporting to the publisher, usually on a monthly basis. They will manage individual orders on terms and conditions set in advance by the publisher. Gardners is the best known UK wholesaler and they also offer distribution services to key accounts. 5. LAST BUT NOT LEAST, THE LEFTOVERS…. You will find books that perhaps didn’t sell as well as expected on the Remainders and Promotional Dealers stands. It doesn’t necessarily mean that they didn’t sell at all, but that the publisher didn't sell as many as expected in that format, overprinted, received significant returns or needed to transform slow stock into cash. The publisher will sell books at massively reduced prices to the bargains wholesaler or retailer, who then offer them at knockdown discounts. These are the last stops a book may make, and most will, instead of being returned to the publisher to be pulped. There are positives and negatives for an author of this step in the chain - it may mean that your book reaches a wider audience than otherwise and perhaps the book is selling well in another format, but you will receive reduced royalties. The largest remainder exhibiting at LBF is Daedalus. James Patterson is today's Author of the Day on Monday 20th. There are so many seminars and events going on, the best thing to do is to check the London Book Fair website seminar programme to get a good overview. A couple of seminars I’ve noted include Writing for Teens at 12.30 on the Tuesday, and Writers of Tomorrow with Antonia Byatt. Authors can also check out the LBF podcasts anytime, which include interviews with leading authors such as Sebastian Faulks and Francesca Simon. From Publishers and Rights' Sellers through Book Buyers and Booksellers. There are Printers and Packagers, Wholesalers and Distributors, Remainder Dealers and Digital Content Suppliers all at the Fair. And that’s aside from supporting organisations and associations, such as the Society of Young Publishers or DACS, or those involved in press and promotion. But what about the agents and what is a literary scout? What are the deals that go on at LBF and why is the ‘rights buying’ considered so important at London? Tomorrow: What’s the Big Deal? LBF and rights negotiation. Part five - The Wrap up. Part four - What's the Big Deal? LBF and rights negotiation. Well we'll be there - Pete Jessup and Jonny Mardling from History Direct that is. To raise our profile as Online booksellers and network which is the biggie of course. Hope it's a good week for you. Let us know how you get on.